While Browsing through net you all might probably encounter this “Error 404? “Page not found” is the error page displayed whenever requested page is simply not available on your site. The reason for this might occur is that there may be a link on your site that was wrong or the page might have been recently removed from the site. As there is no web page to display, the web server sends a page that simply says “404 Page not found”. When we expand the code 404, the first digit “4” represents a client error. The server indicates that you did a mistake like misspelling the URL or requesting for a page that is no longer available. The middle digit, 0 represents a general syntax error and could indicate a spelling mistake. The last digit, 4 refers to a specific error in the group of 40x. 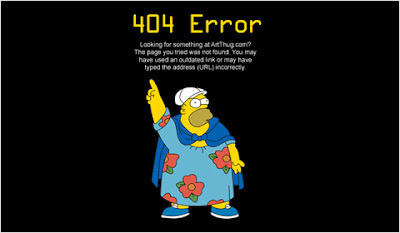 The 404 error message is an HTTP (Hypertext Transfer Protocol) standard status code. This “Not Found” response code indicates that although the client could communicate to the server, the server could not find what was requested or it was configured not to fulfill the request. The 404 “Not Found” error is not the same as the “Server Not Found” error which you see whenever a connection to the destination server could not be established at all. Whenever you visit a web page, your computer will request data from a server through HTTP. Even before the requested page is displayed in your browser, the web server will send the HTTP header that has the status code. The status code provides information about the status of the request. A normal web page gets the status code as 200. But we do not see this as the server proceeds to send the contents of the page. It’s only when there is an error, we see the status code 404 Not Found.